We produce enough food within our borders to feed our people, to have about half of them get overfat, to waste enough in trash cans to feed another 50 million people per day, and to ship enough overseas to help our foreign trade deficit. America is unquestionably the most agriculturally productive nation in the history of mankind. How can there be malnutrition in such a land of plenty? There is. Put simply, we make the wrong choices. Ten percent of Americans are starving, and although the rest have ample food available, many Americans make poor decision at the dinner table. The ideal strata of population for properly nourished should be those who are wealthy, young, healthy, and intelligent. Yet in a study of Yale students, 18 percent were found to be iron anemic. Until this century, very few people had enough to eat. Most cultures ate as much as they could when they could find it, and it was not enough. The few cultures that had food abundance had no refined “junk food” to select from. In other words, we are one of the first societies to have not only enough food by many depleted foods to tempt the palate and ruin the body. Do You Eat Time-Release Foods? Recently in a supermarket I saw one corpulent man in his forties unloading his cart onto the checkout stand. His purchases typified the American attitude on nutrition. Hot dogs, buns, chips, candy, beer, vodka, and canned olives were followed by a bottle of generic vitamins. This rather unhealthy-looking fellow had some vague notion that nutrition was related to health, so he was willing to make the ineffective concession of buying the cheapest vitamins available to somewhat compensate for his cornucopia of non-foods. We are deficient in numerous nutrients. Our rapidly changing modern lifestyle has spawned many poor dietary habits. We have deviated substantially from our evolutionary heritage of what our ancestors ate. The plethora of drugs, alcohol, and tobacco being consumed create serious malnutrition. Our polluted environment creates higher-than-normal nutrient demands. Food refining removes many valuable nutrients. Modern agricultural techniques often do not properly nourish the soil. So, when you factor in 92% of Americans are deficient in one or more essential nutrient, plus the 2/3 of Americans who are overweight, which increases the risk for cancer, it is not surprising that 42% of Americans born today will develop cancer in their lifetime. Prior to 1900, experts estimate that cancer was a condition found in less than 1% of the population, primarily the elderly. Even if all other factors were ignored, we are the first nation in history to have the potential for optimal health rather than just survival. So why settle for anything but the best? We actually eat fewer calories than past generations. Our sedentary lifestyle is at fault here. Experts have calculated that few sedentary people, even when following an ideal nutrition pro­gram, could consume their RDA for all nutrients without causing overfat­ness. Because we exercise so little that we need less food, it is difficult to get the nutrients we need from food. Enter the subject of nutrient density and quantity of food. Not only do we eat less, but the food that we do eat is refined into a depleted state. Nutrient density refers to the amount of vita­mins, minerals, fiber, and protein per 100 calories of food. The higher the nutrient density, the more nourishing the food. Since these major dietary surveys, others turned up equally impressive deficiencies among Americans. Excellent studies show that areas of America that have low selenium levels in their soil, and hence in their diet, also have significantly higher cancer rates.4 Low chromium in the American diet is a major factor in the incidence of heart disease, diabetes,· and probably other ailments, such as cataracts.Are you Magnesium Deficient? The average daily intake of chromium for men is 33 micrograms and women 25.5 The RDA board recommends 50 to 200 micrograms as a safe range, while other scientists have called 500 micrograms a more ideal intake. Older adults are experiencing an epidemic of osteoporotic broken bones. Hollowed bones are used by, among other things, too little calcium and vitamin D. Though the RDA for calcium is 800 milligrams for older adults and may be raised to 1,500 with good rea­son, most adults get about 500 to 600 milligrams per day. Our vitamin D intake is equally atrocious. The term pantothenic acid is derived from a Greek word meaning “everywhere.” Everywhere but in the refined American diet, one might add. One study found that nursing home residents were consuming only one­ third of their RDA for this often ignored nutrient. Another study found that adolescents consumed about half of their RDA for this “everywhere” nutrient. Pantothenic acid is lost in wheat milling and other food processing. The American diet has excessive levels of fat. Most nutrition textbooks consider that the requirement for the essential fatty acid is easily satisfied since we eat so much fat. Yet 60 percent of the fats consumed in this country are hydrogenated, meaning saturated and forced into an unnatural configuration through reining techniques. Hydrogenated fats do not satisfy the body’s need for the essential fatty acid. They also surreptitiously fill the crucial roles of the essential fatty acid yet do not perform as they should. Alcohol, though not nutritious, is a nutrient by virtue of its seven calories per gram. Americans consume 10 to 20 percent of their total calories from alcohol, which is two to four times the recommended upper limit. The so-called balanced mixed diet has been proved to be insufficient. Many health care professionals say the four food groups make up a balanced diet. Studies have shown that a person might meet all the criteria of the four food groups and still he blatantly deficient in vitamins E, B6 , folacin, magnesium, zinc, and iron.13 Goiter, long thought to be extinct in America, was found in more than one out of three schoolchildren in rural Kentucky, even though their iodine intake seemed adequate. We take all of the above information regarding nutrition, obesity and cancer risk; then add the newly discovered mechanisms that drive cancer: insulin, fatty tissue, chronic inflammation, excess sugar, deep fried foods that are loaded with carcinogens. Of the 1.5 million Americans who will be newly diagnosed with cancer this year, at least 117,000 developed cancer solely due to obesity. We can do better than that. 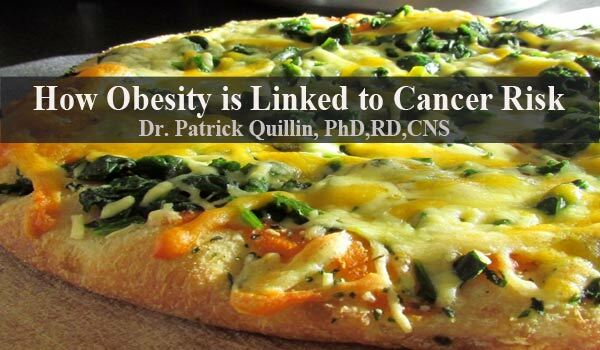 Stay tuned for more on how obesity is linked to cancer risk.